Platycephalus indicus (bartail flathead) is dominant species of Platycephalidae family in Iran’s southern waters, especially Khuzestan province and mainly is captured by bottom trawl and gillnet. The population biology of this species in the northwest waters of Persian Gulf (Iran) was investigated to derive information required for its management. Parameter values of the von Bertalanffy growth Function fit to size at length frequency data (males and females combined) were: k = 0.5year−1, L∞ = 62.16 cm, to = −0.26 years. 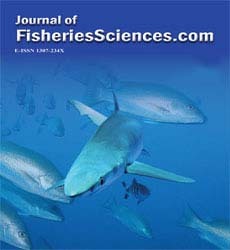 The estimated valve of total mortality, natural mortality, fishing mortality and Exploitation ratio (males and females com-bined) was: Z= 2.59 year-1, M= 0.77 year-1, F= 1.82 year-1 and E= 0.70, respectively. Exploita-tion rate, U and Annual total stock at beginning of year were 0.64 and 1194 T respectively. Annual average standing stock, b= 420 T, MSY= 544 T and MCY=362 T were estimated re-spectively. Result in this study showed exploitation ratio the bartail flathead stock is lower MSY and upper MCY. The results of the study highlight critical resource base issues and pro-vide the direction for the future management of this species in the northwest waters of Persian Gulf.